Where do you want to go? What do you want to see? VIP Express Tourism Limited can take you and your family there. Tell us your dreams, let us shape them into true stories. Like you, we strive for change and opportunity. Our travel and accommodation services are centered around your desire for experiencing family time in abundance. Partner with us so that you and your loved ones can escape the hustle and bustle of daily routine and live out the fantasy of luxurious accommodation and tranquility. Once you get captivated by wanderlust, you’ll want to experience it over and over again- and you’ll want to share it with your circle of friends, too. This is why we offer you the opportunity to join our referral program. If you invite your friends to join us, and they subsequently become members, your fortune will start growing with a passive secondary income. Become a member and introduce your family to expanded horizons. Undergo culture enrichment and submerge in picturesque surroundings. We have the key that unlocks your dream vacation accommodation and opens you up to new homes away from home. With us, you can create memories of a different world- one of a rejuvenated soul and a refreshed spirit. This is your time, this is your now. You deserve this. Get the latest deals & specials! 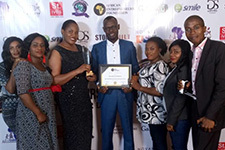 Excellence was celebrated once again at the Africa Entrepreneur Merit Awards (AEMA) where VIP Express Tourism Limited added another glowing feather to her cap. 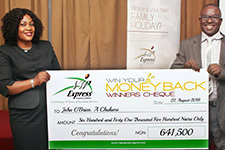 Congratulations to Dr. & Mrs. O’Brien A Chukwu who are the latest winners in the ‘Win Your Money Back‘ competition. 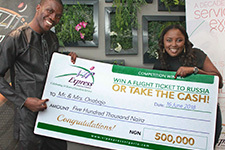 The winner of the VIP Express Tourism Competition, where a member could WIN either a flight ticket to russia or the cash prize of NGN500,000, has been announced. We are proud to announce the second winner of our exciting competition; Win Back Your Money! 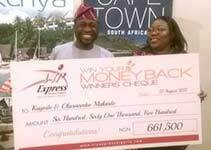 Mr. & Mrs. Makinde are the second winners of this amazing competition that will run until June 2018. Watch how pleasantly surprized they were to win! Are you seeking an employment opportunity?